This striped StyleMint T is so cozy and casual. It was exactly what I was looking to pair with my red pants and classic trench. Can't go wrong with this. Perfect. And your pup is incredibly cute!! Simple + classic. Love it! Definite classic! Very Parisian. Of course, always happy to see Luca featured! 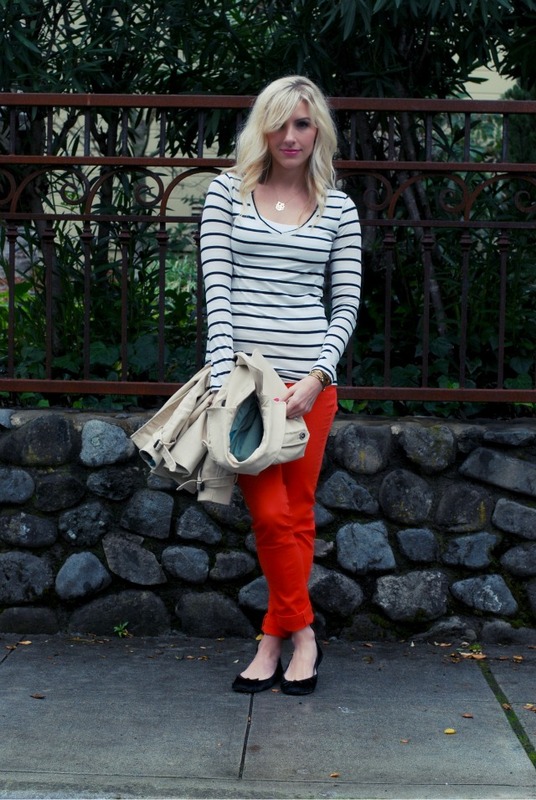 Love it paired with bold red to anchor the look...nautical cashz...great mix! seriously ... great outfit and super cute pup!! you look gorgeous!! i love those flats. now this is an outfit that i'm actually bold enough to wear! Aren't StyleMint tees just amazing?! Great outfit. The classier, the better. Classic outfits like this make the world go round. Love this look, so timeless. love those red pants!! you look so cute! Love the red with the stripes!!! i love your pants...and your puppy!!! What a great outfit and adding the pup into the mix just makes it more perfect! Love this outfit! Esp the pants..and you hair is gorgeous! Such a simple and casual look. Simple truly IS best :) You are rockin this classy striped outfit! Love the mix of all these classic pieces! Red pants are a must! Cute simple outfit, and your dog is precious! Love this look. classy and simple all at the same time!! awww your puppy is so cute! LOVE the striped shirt/colored denim look!! love the colored jeans! and your pup is so cute!! So simple and classy! i am lovin it! Nice naval look. Love those red pants. red, stripes and a classic trench!! fab!!! Looking so cute love those red pants! So easy and chic, makes a great combo! Those red pants. I'm DYING -- they're soooo chic! I'm always up for a classic look. Love it. I love the simple striped top with a bold pant. Looks great. Oh your dog is so cute!! I am also loving the outfit!! The orange pants are great on you! I'm a sucker for red paired with stripes... so obviously I'm loving this outfit! great top & what a cute puppy!! xoxo! Love the shade of that red- gorgeous! This is such a fantastic look! Love how you executed it! Perfect casual uniform. Definitely cannot go wrong. Happy Friday! Love this simple but super chic look. A perfect go-to-outfit! Love it. Love the simplicity yet classiness of the outfit!!! Those pants look really good!! !